The Marvel Television Universe is in trouble. And it’s a shame, because they were finally starting to figure some things out. That started — improbably — with the second season of Iron Fist, which improved by giving valuable storytelling real estate to fan-favorite Colleen Wing. Then the next installment of Luke Cage delivered a better-paced narrative, a compelling villain in Bushmaster, and an intriguing Godfather-inspired ending. But those shows are now cancelled. Fist’s axing wasn’t that much of a surprise, but Cage’s was, and the line in the trades is “creative differences” between creator Cheo Hodari Coker and the bosses at Netflix. Cross your fingers, perhaps, for a reborn Daughters of the Dragon or Heroes for Hire series on the new Disney+ service, but the Defenders brand as we know it — best exemplified by the lackluster miniseries team-up — is dead. Jessica Jones showrunner Melissa Rosenberg just left for a lucrative deal at Warner. The Punisher recently wrapped its second season, but who is really excited for that, save known super-fan Tim Duncan? So thank God for Daredevil, which last month dropped not just its best season, but the best season of any of these series (edging out the terrific first season of Jones). It’s got everything: proper emotional arcs for multiple characters, the titanic Vincent D’Onofrio returning as Wilson “Kingpin” Fisk, a terrifying new baddie in Wilson Bethel’s Bullseye, and the action scenes that have always been the series’ most reliable element. Much of the praise has been in response to the fourth episode’s showstopper, an astonishing, 11-minute unbroken take featuring Charlie Cox’s Matt Murdock (out of costume) fighting his way through a prison riot in between extended dialogue scenes and a few clever “Texas switches.” That sequence lived up to the hype in every way, but the season’s successes fortunately didn’t end there. The main thrust of the story goes back to what made the first season so successful: Daredevil vs. Fisk. (No more waves of faceless ninjas!) Kingpin engineers a secret coup of the FBI to get himself out of prison and back running Hell’s Kitchen; meanwhile Murdock, recovering from having a building fall on him at the end of The Defenders, flirts with crossing his moral boundaries as the casualties pile up. To break Murdock, Fisk enlists psychopathic agent Poindexter — who has deadly aim with any object that can be thrown — to run around town in a stolen Daredevil outfit and turn the city against the vigilante. You can imagine how easy he finds that to be. Comics’ most Catholic superhero still wrestles with guilt and doubt, at one point willing to reject God altogether in order to bring Fisk to justice. Should there be a fourth season, that will continue to be a rich vein for Daredevil‘s storytelling. And if there isn’t, the series went out as the best version of itself. It’s hard to write about Sam Esmail’s new series without getting into spoiler territory, so in case you’d like to discover its pleasures for yourself (as you should), I’ll keep this brief and vague. The Mr. 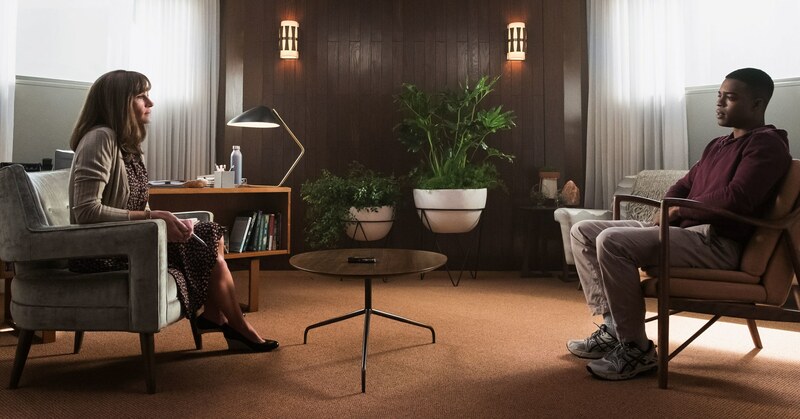 Robot creator adapted Homecoming from the popular podcast series — because podcasts are IP now — along with Eli Horowitz and Micah Bloomberg, and directed every episode himself. First, the very good news: This is a half-hour drama. You read that right. It’s only a five-hour commitment. The episodes tease out the series’s mysteries up until the very last shot, but it never has to spin its wheels or manufacture tension needlessly, and the chapters fly by so briskly I was compelled to keep going. I can’t tell you how refreshing that was. What’s it about? It’s set at a privately owned facility in Florida (we’re told) where recently-returned soldiers are given the opportunity to review life and social skills before they re-join society. That includes processing their experiences with psychologist Heidi Bergman (Julia Roberts, making the leap to TV), who dutifully records it all. Tired of her wet blanket boyfriend (Dermot Mulroney) and her aggro boss, Colin (Bobby Cannavale, who spends most of the series yelling at Roberts over the phone in split-screen), she strikes up a friendship — and perhaps more — with new arrival Walter Cruz (Stephan James, the upcoming If Beale Street Could Talk) that could jeopardize the real work being done at Homecoming. Of course, the real experience of watching the series isn’t that simple. Esmail plays with parallel timelines, toggling between Homecoming in 2018 and the true “present day” of 2022, as DoD investigator Carrasco (Shea Whigham, sporting magnetic reading glasses and radiating world-weariness) tries to chase down the story of the program’s collapse. We get shifting aspect ratios, which help to keep Esmail from using Mr. Robot’s patented lower-quadrant framing as a crutch, instead providing stylistic flourishes with nimble camerawork (including, of course, a few long takes) and evocative lighting, like the infinite purgatory of the DoD records room. Even the end credits, where the episode’s last shot lingers on uncomfortably, voyeuristically, point toward’s Esmail’s fanatical attention to detail. The show looks incredible — it’s cinema, but bite-sized. The eighth episode, where one of the story’s bubbles finally bursts, features one of the year’s most memorable shots in any medium. Your emotional investment, however — whether any of the bells and whistles actually mean something, or just feed paranoia — depends on how much you buy the chemistry between Roberts and James. But despite the age difference and the series’s general chilliness, it’s crackling. Roberts is pretty understated as Heidi, never really cutting loose for the big JULIA ROBERTS moment we’re used to, but it’s an expertly calibrated performance. James, for his part, is incredibly appealing. Whigham is terrific. Cannavale is playing a monster, but he lets us see enough vulnerability to make him empathetic. And right at the end, Hong Chau just about walks off with the whole thing. Apparently a second season is already in the works, and though Esmail has earned the benefit of the doubt, Mr. Robot also took a while to find a new identity after its first season’s big reveal. I don’t know where else Homecoming can go that is more interesting than this. Netflix really, really wants to be a legitimate distribution choice for prestige filmmaking. They let the Coen brothers retrofit their western anthology series The Ballad of Buster Scruggs into a feature (releasing next week), and are making the out-of-character choice to release Alfonso Cuaron’s Best Picture contender Roma in select theaters prior to its streaming date in December. They’re even the new home for Orson Welles’s long-lost The Other Side of the Wind, though I don’t imagine its Oscar chances are that high. But their latest effort, in between weekly teen rom-coms and C-grade science fiction, has had its arrival trumpeted on your home screen even while the film itself was in flux. Outlaw King got a very tepid reception at TIFF, prompting director/co-writer David Mackenzie (reuniting with Hell or High Water star Chris Pine) to slice 23 minutes from its run time. 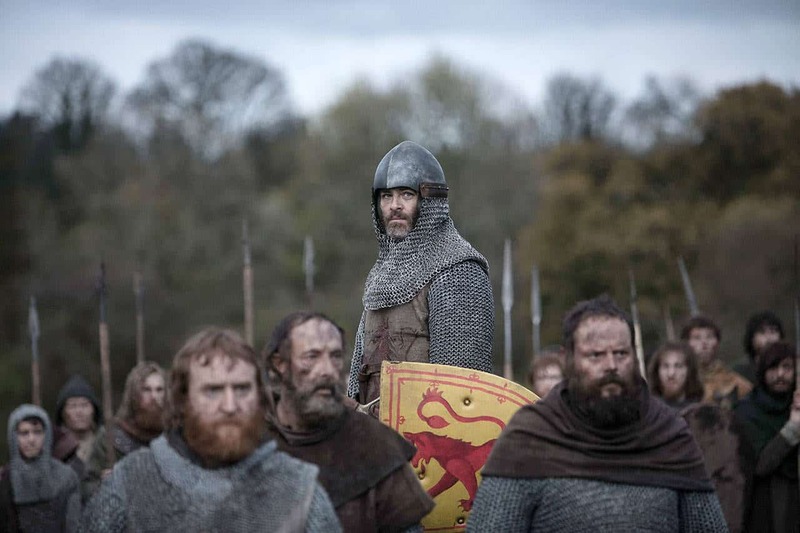 He’s talked about in interviews how he felt Outlaw King wasn’t really ready for its festival debut, and that he was grateful Netflix allowed him the opportunity to chisel it into shape before wide release. However, after watching this leaner, “final” cut, I couldn’t help but miss those extra 23 minutes. This Outlaw King certainly isn’t slow — it entertains, it’s vibrantly lensed by Barry Ackroyd — but it’s often confusing in both character and geography, making perfunctory what should be inspiring. The boldest choice Mackenzie makes is its opening scene, a long and audacious steadicam shot — yes, another one, everyone’s doing it — through the pre-battle royal tent of Edward I (Stephen Dillane) as he congratulates the Scottish Bruce clan on sucking up to him enough for the younger Robert (Pine, truly the Thinking Man’s Chris) to be granted the title of puppet liege. From there, it’s basically a Braveheart sequel, complete with gorgeous landscapes, chivalrous romance, mists of viscera, and more than one actor devouring the scenery down to the studs: Token crazy guy Aaron Taylor-Johnson (like Stephen O’Hara’s Irishman, but with more beard) as a Bruce ally, and a spluttering Billy Howle as the eventual Edward II. Howle reminded me of Oscar Isaac’s ignominious turn in Ridley Scott’s Robin Hood, a performance so bad from an actor now so beloved it defies belief. I don’t expect Howle to have the same career arc, but if he does, I’ll pretend I always knew it would begin here. Anyway, Outlaw King is…fine. Chris Pine gets a B+ for his accent work (it doesn’t hold up next to True Scotsmen Tony Curran or James Cosmo, but it’s better than Mel Gibson’s), and an A- for everything else. His scenes with his new court-appointed wife, Elizabeth (played with strength and intelligence by Florence Pugh), hit their marks. The many, many, battles are staged excitingly (and differently) enough — woods, rivers, fields, courtyards — despite the lack of clarity for what they signify: Robert’s rag-tag band of rebels are doing well, then they aren’t, then they really aren’t, then they kind of are again, you get the idea. The problem is that the story moves at such a clip (you can feel where beginnings and endings of scenes have been lopped off) that nothing really has the emotional resonance it should. I love medieval films, as a rule; it would have to be really dumb or really boring for me not to get into it. Outlaw King is neither, but it isn’t that memorable, either.